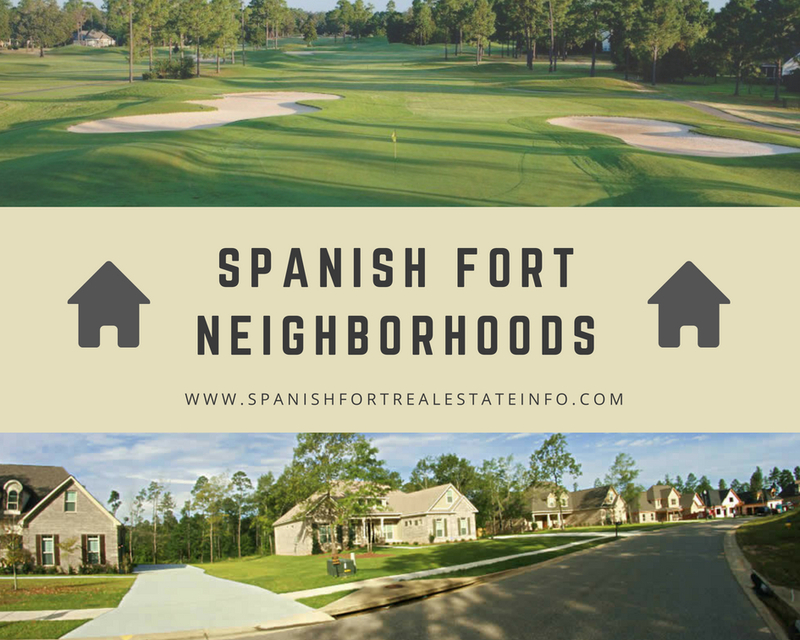 Here you will find all of the neighborhoods in Spanish Fort AL. By clicking on each link below, you’ll see details about the community, property details, and photos for each neighborhood. Come back often. I’ll continue to add Spanish Fort neighborhoods as they come available. Audubon – Large homes in a prime school district. Blakeley Forest – Established neighborhood in Spanish Fort with large homes in a heavily wooded community. Bromley Acres – Large homes on wooded lots. Cambron – Very popular neighborhood in Spanish Fort. Large homes between $108 and $120 a square foot. Churchill – Homes from 2,500 to 3,400 square foot. Very popular neighborhood. Garrison Ridge – Attractively wooded neighborhood with large homes. Close to shopping, great schools, and the interstate. Grace Magnolias – New and newer homes in the heart of Spanish Fort. Just minutes to all of the shopping you could handle. Heidelbrook – Nice looking affordable home options, close to schools. 3 to 4 bedrooms under $200,000. Highland Park – New construction literally minutes away from Spanish Fort schools. Prices are from $111 to $130 per square foot. Highpointe Place – Affordable ranches along Route 31 and very close to Rouse’s Grocery. North Lake – Spacious homes on large lots in Spanish Fort. Osprey Ridge – New construction by Truland Homes off of Route 31. Rayne Plantation – Beautiful neighborhood with large homes, close to shopping and restaurants. Savannah Woods – This is a very popular neighborhood located off of Route 31. You’ll find Craftsman style homes at a good price point. Spanish Fort Estates – Large neighborhood with many different home styles, close to the bay and the interstate. Stillwater – Large custom built homes on big lots, off of Route 225. Stone Brook – New homes at a very affordable price per square foot near Spanish Fort Schools. Stonebridge – A very popular neighborhood with many floor plans and prices. Nice amenities! Tanager – Quality homes built between $113 and $124 per square foot. Timbercreek – Here you will find one of the most outstanding and desirable neighborhoods in Spanish Fort offering many different floor plans with various square feet and styles. Walden Subdivision – Large homes and lots in a rural section of Spanish Fort. Wilson Heights – An older neighborhood with great prices in popular Spanish Fort.